Have you had the same experience as this lady ? I would be interested to know. 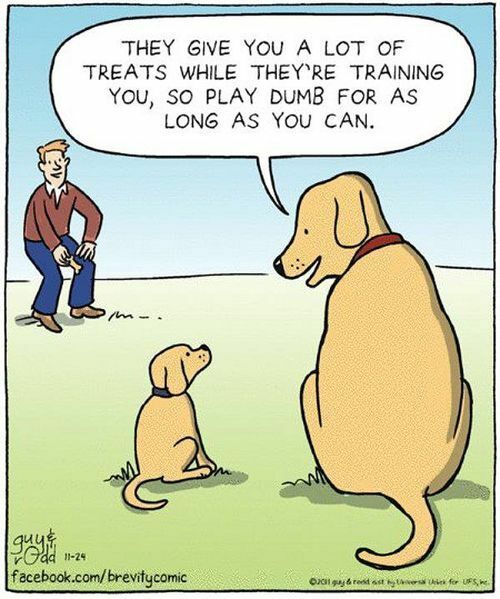 Met with a lovely lady and a spaniel last week that has been going to a food based trainer in the area for the last couple of months (which should have been around 5 hours of 'training'). The lady and her spaniel were part of a class of 12 dogs and handlers and she was 'allowed' 5 minutes of the instructors time during that hour which meant for the remaining 55 minutes she was teaching her dog (or rather bribing her dog to sit), with no further interacation with the instructor (who had no assistant instructor helping her). The lady was paying £20 for a course of 5 lessons, £4 per lesson. Now maths is not my strong point, but that equates to 5 lessons of 5 mins 25mins of training for £20 = £48 per hour. Needless to say the lady was getting frustrated with her dogs apparent lack of progress, and having been shown how to get pup to touch a hand, roll over, give a paw, and sit, the lady really didn't get the sort of help she actually wanted !!! how to instill manners etc. Now you might think she was expecting too much for her '£48' per hour! Through a friend, I was contacted by the lady, with "Hello, I need some help"! First off, we went through why we praise and play. The lady was shown exactly how to do it, and within a few moments, the pup was sitting by her side looking at her! Eye contact!!!! Next up, Walking on a loose lead, because we have already told the pup what fun its in for, we start to use the fun once the dog has done what we want of it. We set off and guess what the dog pulled, so we set about working on the walking with a few corrections in place, and a method that suited the lady, and we started getting pup paying more attention and walking on a loose lead. More important than the quick progress was the fact that the lady was actually listened too, and she was working on bits with her dog that she actually wanted to, she has since gone home with homework and already booked a further lesson for the next few things on her list. Having listened to what she wanted, and come up with a way to get it that suits her, the lady is now smiling and enjoying her training !! You can too. If you are not getting value for money with your dog training, or simply feel your not progressing with your training or not learning things that matter in your environment then give me a call for a chat.